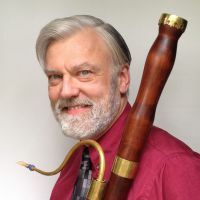 Additional Info: R. James Whipple is based in Pittsburgh, Pennsylvania USA where he has been the bassoonist and Artistic Director of the Renaissance City Winds, a double wind quintet, since 1975. He also plays Baroque bassoon with Pittsburgh Baroque and Cameo Baroque. An accomplished composer, he primarily writes wind chamber music. He teaches composition, counterpoint, and secondary bassoon at Carnegie Mellon University’s School of Music, and is the Coordinator of Chamber Music. He studied bassoon with Arthur Kubey, Richard Plaster, and Mark Popkin.